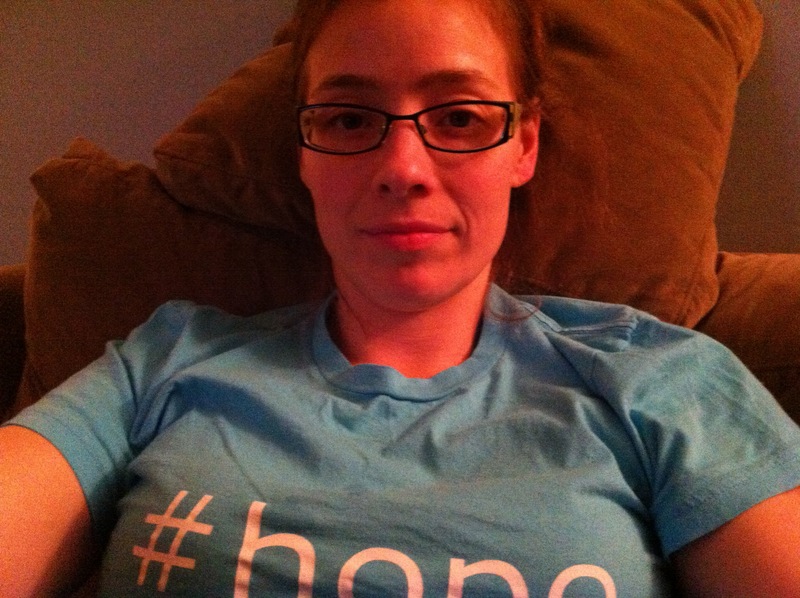 Around this time three years ago, the amazing infertility advocate Jen sold t-shirts online with “#hope” on them. I bought two at the time, one in a youth size small for Leopold (who was 1.5 at the time) and one in a women’s size XL for me. 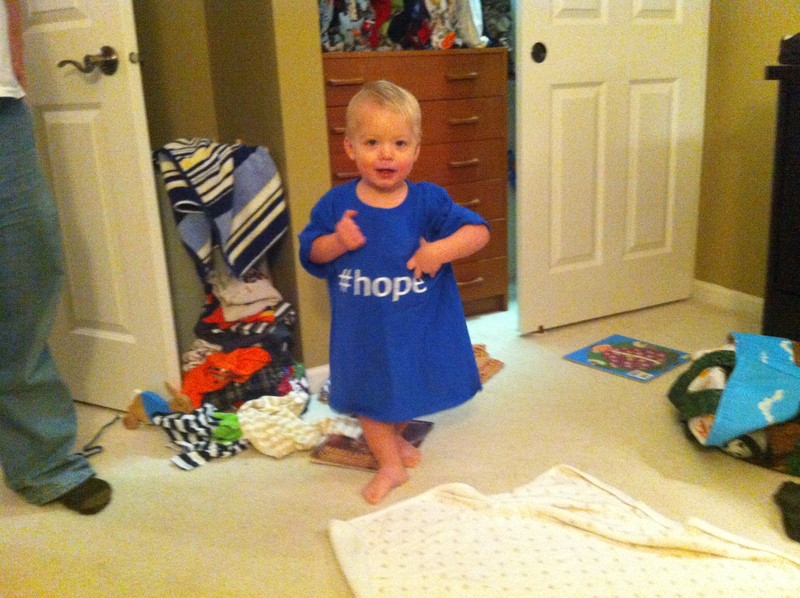 The first time Leopold tried the #hope tee on. I was doing fertility treatments again at the time to try to conceive Kate. At the time, this shirt meant hope I had in defeating infertility and being able to expand my family in spite of it. Hope that if I continued to fight, my family would look how we wanted it to, somehow, if I tried and fought hard enough. My 4 year old son fits pretty well in his kid’s t-shirt now. That in and of itself is pretty telling that my perspective has changed on what this shirt means. It means having the strength to walk away from the fight, enjoy life, and raise these two children to the best of my ability. me, in my hope tee. about 2.5 yrs ago. Hope that I can make peace with my body after being embarrassed, hurt, and frustrated of its inability to conceive and carry a child for so long. Care for it instead of curse it, nurture it instead of injecting it with fertility drugs. Focus on the fuel that I’m putting into it and what it can accomplish instead of focusing on what it cannot. It means I have the tools to empathize with other women fighting for their families or struggling with juggling medical appointments as well as work and family commitments. hope that I can be a sympathetic ear and a sounding board for friends who will fight this fight. Hope that I have been through all of this and that I can now let some of the pain, frustration, and anger, GO. That I no longer cry at the sight of another woman’s ultrasound picture or positive pee stick, or crumple into a ball when someone close to me announces excitedly that a baby is on the way. My fight is over and I’m so very fortunate to have two kids and experienced growing them inside me, birth them, and breastfeed them. Someday, I can hear another woman talk about how easy it was for her to have kids and how the perfectly timed them and not inwardly grimace. I’m not quite there yet. I’m working on it. I hope that I can go through the rest of these periods before menopause without trying to conceive. Letting it go, letting what will be, be. Que sera, sera. Not count cycle days or be upset when my period shows up for the umpteenth time. I’ve thought about taking precautions, but it seems silly and my body really hated birth control. We have conceived sans help twice so I know it is possible but also very unlikely. We’d love another child, but I’m not willing to do treatments, suffer through more miscarriages or ectopics, or even try at all. 7.5 years is long enough. This bit is tricky and I’m sure it will change over time, but for now, I’m just letting things be and trying not to think about the remote possibility of conceiving. hope that when menopause starts for me, earlier than for most women I’m sure as my official diagnosis is premature ovarian insufficiency, I’ll be able to roll with it. I can’t imagine how this will feel or what it will do to my body, but I hope that knowing that this will come early for me since I was 26 will help me deal with it when the time comes. I know I’m very lucky to be where I am, to be able to walk away from this fight with two kids in tow and my reproductive organs intact. I know things look much different for others who deal with chronic pain or hormonal problems, achieve parenthood through adoption,surrogacy, or donor gametes, or go on to live child-free after infertility. How has your perspective changed through this journey? What does #hope mean to you now? #hope It means something so different for each person. You have fought the fight. You have survived the battle and achieved great things during the war. Your perspective is inspiring and amazing and I #hope to have your strength and fortitude some day. You have found peace in this chapter of your life. And through it all you still have #hope. You are amazing. I love this. I’m in the odd situation of wanting a 3rd but having a spouse that doesn’t even want to try, and it is WAY bizarre to have it be something so “normal” and mundane as the reason we won’t have another child instead of it being IF related. I’m proud of you for working to find peace (and joy!) with the family you have. Really good post, A. Proud of you! I hope you find all these things. Once we adopted our second baby, it was like a giant weight lifted. I had two kids and that’s what I wanted. Now it’s onto raising two energetic boys. 🙂 I actually don’t think that resolution is different with adoption. I think that resolution is different for people whether who are able to achieve what they want in terms of family.